Is Dell Streak (formerly known as the Mini 5) a tablet computer or a smartphone? We could say both since it is big and powerful enough to be considered a tablet PC, and small enough for those with big hands and can make calls to be considered a phone. I was impressed with the 4.3-inch display of the Motorola Droid X, but the Dell Streak's 5-inch capacitive touchscreen display that is capable of 800 x 480 pixel resolution is even more impressive. Its sleek and elegant design makes it a certified head turner. Based on looking some of the photos and videos, I would say that it's one of the most gorgeous-looking Android devices that I've ever seen. Like the Google Nexus One, the Dell Streak is powered by a 1 GHz Qualcomm QSD 8250 Snapdragon ARM processor and 512MB RAM, and it uses Adreno 200 GPU. It has a 5-megapixel autofocus camera with dual LED flash and video recording capability. It also has a front-facing VGA camera that can be used for making video calls. The Dell Streak offers 2GB of internal storage but the storage capacity can be increased via microSD slot, which can hold up to 32GB of memory card. Its 5-inch capacitive touchscreen display makes it possible to conveniently type documents, browse the web, read eBooks, and watch videos. The three buttons that can be seen at the bottom of the device are also capacitive. 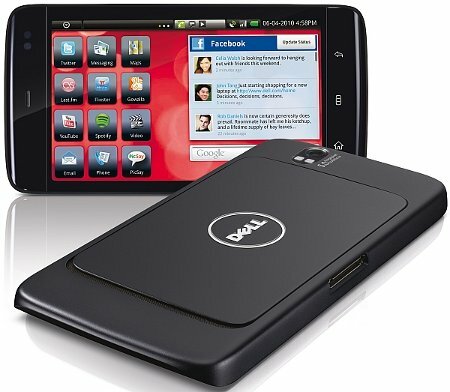 The Dell Streak still runs Android 1.6 (Donut) operating system and features a customized user-interface. However, Dell promised that the OS will be updated to Android 2.2(Froyo) later this year. Talking about the UI, its homescreen icons are placed in shaded boxes, and there is a drop down menu from the top that can shrink to a favorites bar. On the top bar, you will have quick access to homescreen-switching button and you will see the notifications and status area. The Dell Streak can be purchased for $300 with a two-year AT&T contract, and $550 for the unlocked version. If Dell wants to compete with the iPhone or the iPad, I think they should lower the price. Also, there are already several Android smartphones that are more affordable and are equipped with similar high-end features like the Streak but with a slightly smaller display. If you can't decide whether to get a new smartphone or a tablet computer, then the Dell Streak may be the one for you.